Asus recently added the details of its new Eee PC 900AX netbook on its global pages.The all new ASUS Eee PC 900AX netbook comes pre-loaded with Windows XP Home Edition. ASUS Eee PC 900AX netbook comes equipped with a 8.9-inch LED-backlit display with 1024×600 resolution and is powered with an Intel’s first-gen Atom platform ie a 1.6GHz Atom N270 processor.The notebook includes a Intel GMA 950 graphics card. The new ASUS Eee PC 900AX netbook houses a 1GB of RAM module and 160GB hard drive.Other features of ASUS Eee PC 900AX netbook includes 0.3 megapixel webcam, two USB ports, 10/100 LAN, 802.11b/g WiFi and a card reader.The notebook is provided with a 4-cell battery that provides about 4 hours back-up life.The laptop weighs about 1.13 kg. 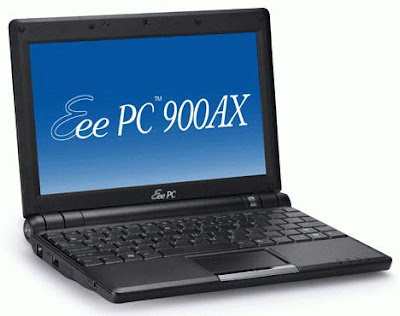 Tags:-8.9-inch notebook, 900AX netbook, ASUS netbook, ASUS 900AX, ASUS Eee PC 900AX netbook details, ASUS Eee PC 900AX netbook features, ASUS Eee PC 900AX netbook specifications, ASUS Eee PC 900AX netbook launch, ASUS Eee PC 900AX netbook specs, Asus Eee PC, ASUS Eee PC 900AX, back, Eee PC 900AX, netbook.